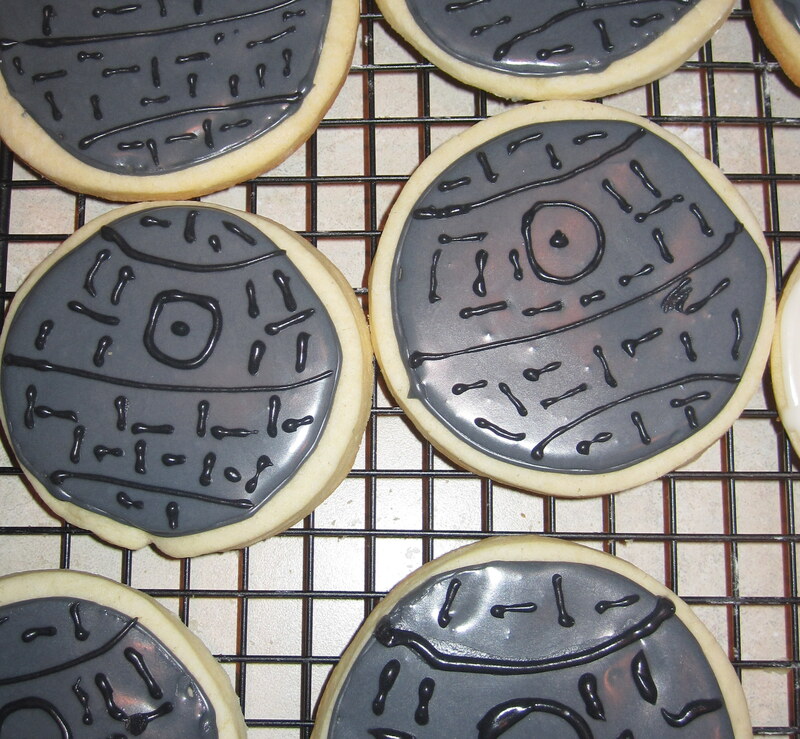 That’s No Moon, That’s A Cookie! One of the great things about winter in Oklahoma is that we sometimes get snow. Typically we get about an inch and then it melts the next day. Sometimes we get more than that and it sticks around a couple days and then melts. Last week was insane. It has been called Snowpacalypse, Snowmageddon and The Greatest Snow On Earth (that last one is mine-hehe). The area of the state I live in has seen record breaking snowfall. Add the below zero temperatures and this stuff is going to be here a while. Geekette has been out of school since Tuesday and we just got another 3 inches last Friday on top of the 14 inches we already had. Needless to say, everyone is going a bit stir crazy and bored. Well, when bored I head to the kitchen and bake. Thankfully, just before we were buried under snow, I got the best rolling pin ever. What a great time to try out my new rolling pin and make some test cookies for the birthday party in the Spring. I searched the web for inspiration and then my favorite baking blogs for some great recipes. I used the recipe for sugar cookie dough and icing from The Decorated Cookie with excellent results. I rolled the dough out on confectioner’s sugar to keep it from sticking. I tried wax paper but it didn’t work for me. I used the 3/8″ thickness on the rolling pin. For the tie fighter I used the sandwich cutter from Williams Sonoma. The only caveat with it is that the dough is a bit hard to get out of the wing portions so be gentle. 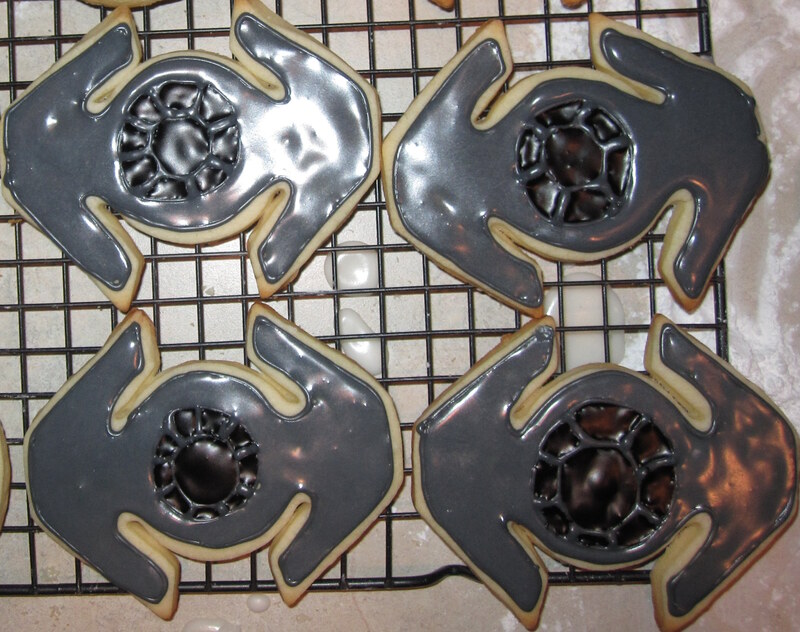 For the death star I used my round cookie cutter set . Once the cookies had cooled several hours, I made a batch of icing, tinted it gray and piped an outline. I let the outline dry about 15 minutes and then thinned the icing with water and flooded the cookie. I let the flooding dry several hours and then piped the details. These turned out fantastic and helped to alleviate the boredom. At least for one day. 4 Responses to That’s No Moon, That’s A Cookie! They look amazing! And I admire your patience, waiting in between icing episodes. We lived a winter in Minnesota and they had a ton of snow. They at least had the equipment to get it cleared. We are at the mercy of the non existent sunshine. These look like so much fun! Thanks for sharing this cool idea!